which communicates with Android framework applications. meters, and Class 1 transmitters can communicate up to 100 meters. you extract maximum mileage out of your device. layers in the Open Systems Interconnect (OSI) standard reference model. support starts at the HCI layer. Figure 16.1. 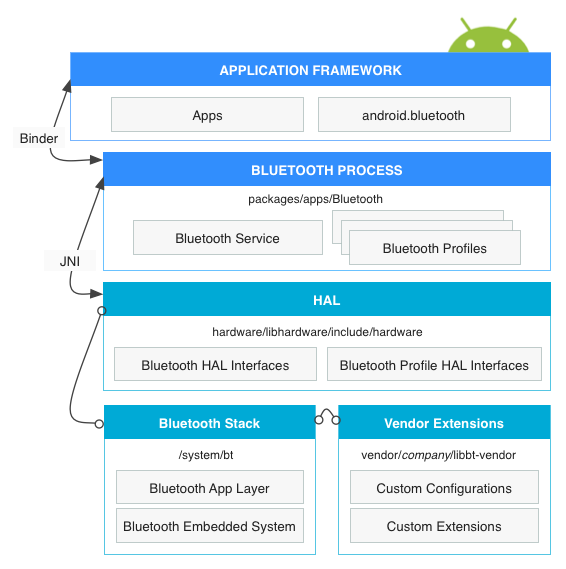 The Bluetooth stack. is by connecting the chipset’s data lines to the controller’s UART pins. another oft-used vehicle for communicating with Bluetooth chipsets. chip on an embedded device interfacing with the processor over USB. calls the Bluetooth process through the Binder IPC mechanism. operations occur, such as when devices are discovered. customizes it with extensions and configuration changes. libbt-vendor module and specify these components.
) to user space and for populating related sysfs entries. hci_uart.ko. For USB transport, it’s hci_usb.ko . also multiplexes between different higher-layer protocols. Ethernet ports over L2CAP using BNEP. 5.The Human Interface Devices (HID) layer is implemented via hidp.ko . BlueZ handle input devices such as Bluetooth mice. and you must implement its functions. bt_av.h: Includes the interface definition for the A2DP profile. include the interface definition for the GATT profile. bt_hf.h: Includes the interface definition for the HFP profile. bt_hl.h: Includes the interface definition for the HDP profile. bt_mce.h: Includes the interface definition for the MAP profile. bt_pan.h: Includes the interface definition for the PAN profile. bt_rc.h: Includes the interface definition for the AVRCP profile. bt_sock.h: Includes the interface definition for RFCOMM sockets. audio data using the Isochronous pipe. class/subclass/protocol information to the Linux USB core. BNEP, while the serial application can be run on the BlueZ RFCOMM. /hardware/broadcom/libbt directory for an example. tracing. See the external/bluetooth/hci directory for an example.